It is a famous saying that Big Things often come in small Packages. Same thing goes with the fruit Kiwi. It is usually small sized green color fruit packed with antioxidants & even more Vitamin C than an Orange. It is also called as Chinese Gooseberry & has an exotic delicious taste. So I thought why not to prepare a Mocktail with Kiwi. Today we are preparing a Mocktail with Kiwi but in a different style. I want to change the perception that only Cocktails (Alcoholic Drinks) can be beautifully served. This drink is very easy & quick to prepare. You can impress any of your friends & family with this drink. So lets make Kiwi Shots. Step 1. In a blender; add chopped Kiwi, Ice-cream, Ice-cubes and Sprite. If you want to give it more color then add only 2 drops of Green Food Color. Step 2. Blend well, until you get smoothie consistency. Step 3. 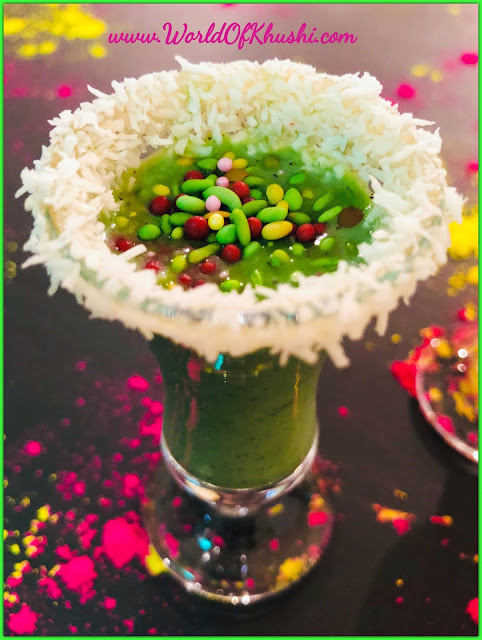 Pour the Kiwi shake in Shots Glasses & remaining in Glass-bottle or Jar for refilling. Your deliciously Kiwi shots are ready. 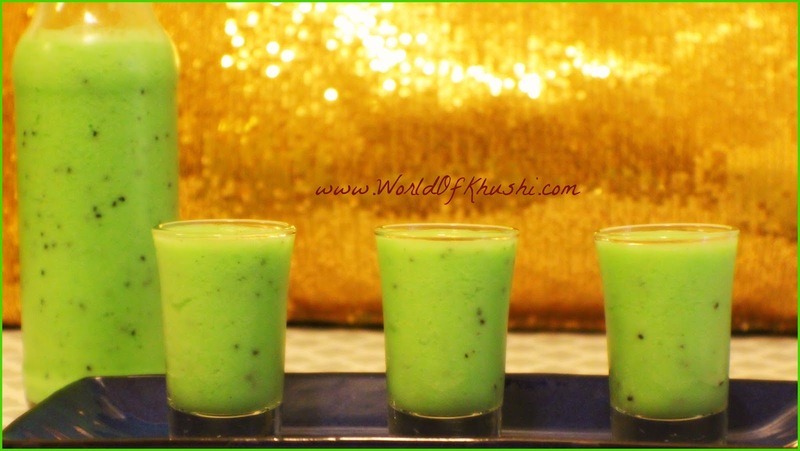 Impress your friends & family with these lovely looking Kiwi shots. You can make it in advance also but whenever you want to drink that time make sure you Mix it properly again as it contains Soda which tends to get separated form Ice-creams and fruits. Guys do like the post & share it with everyone you know. Follow me on Khushi's World FacebookPage, Google+ , Instagram and Pinterest for more Posts.I will see you in next post till then take care.